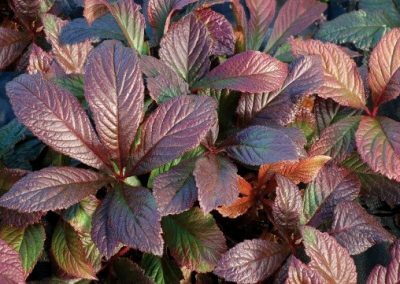 Rodgersia is named after the famous admiral of the United States Navy, John Rodgers, who was born in 1812 in Harford County, in the American State of Maryland. He began his naval career in 1828 as a commander in the American Civil War and during his Postbellum(after the war) service, he became an admiral. From 1852 – 1855 he succeeded Commander Ringgold in command of the North Pacific Exploring and Surveying Expedition, which added greatly to the knowledge of far eastern and northern waters. During this expedition Rodgersia podophylla was discovered. The genus was designated by the American taxonomist, Asa Grey in 1885. He named it after John Rodgers and that’s why the common name is Rodger’s Flower. John Rodgers died in Washington, D.C. on May 5, 1882. 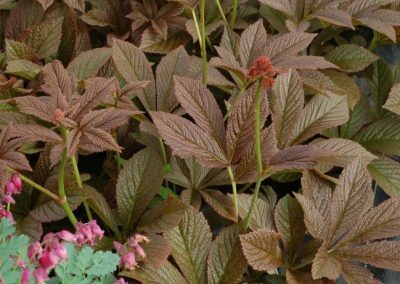 Rodgersia is a species of flowering plants in the family of Saxifragaceae, native to the Sichuan and Yunnan provinces in the southwest of China. The first known use of the addition…pinnata…was in 1719. pinnata has been derived from the Latin word ‘pinna’ which means: feather, feather-like, wing or fin. 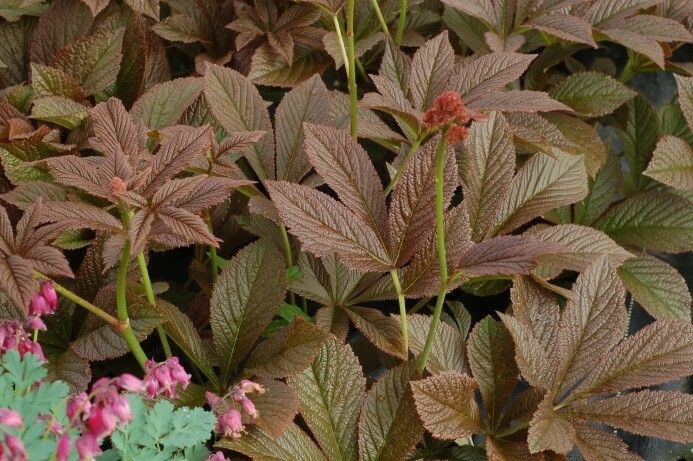 Rodgersia ‘Bronze Peacock’ has the darkest foliage of any Rodgersia. The leaves are thick, glossy, indented and make a great sculptural addition to your garden. Pink, frothy flowers emerge in late spring above the mound. In spring, the bronze leaves emerge like a peacock’s tail. The deep, bronze brown leaves feel like they were hammered out of an ancient metal alloy, so thick and glossy that they cannot be ignored. Large trusses of tiny pink flowers are a bonus. Equally dark and dramatic seed heads are long lasting and showy. 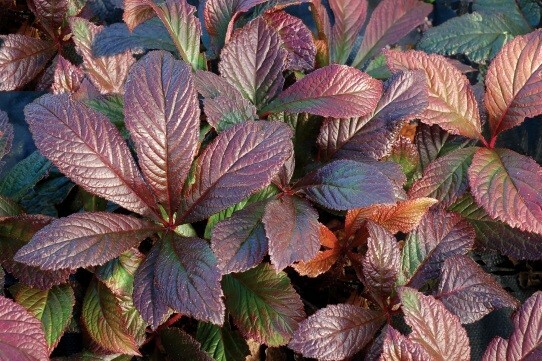 Rodgersia ‘Bronze Peacock’ is an easy care, ground-covering perennial which hardly needs any maintenance.